Recently I stumbled across this article thanks to Carl Hendricks’ recommendation. It describes the work of Maryanne Wolf, who set out to map some of the results of what is the elephant in the room for all of us who teach reading. That the book is losing in the battle for relevance with the phone and the ways that all the digital reading that students (and adults!) do changes the way we read. “This skimming, browsing, word-spotting way of reading on digital screens is bleeding over to all of what we are reading, which has truly potentially pernicious effects on the quality of thought that we are using while we read,” writes Wolf. Our phones keep us from reading. We choose them over books. And even in the increasingly rare moments when we’re reading books our phones distract us and interrupt us. We spend less sustained time reading because we are checking our phones. Or thinking about checking them. A recent study found that just having your phone in the room reduces attention to tasks and reading. And—this is Wolf’s point–even when our phones don’t actually buzz and flash and beep while we’re reading—even if we turn them off or put them in the other room, they have already built in us the habit of distraction. We no longer read with focus and meditation and tenacity. We can no longer sustain our concentration. 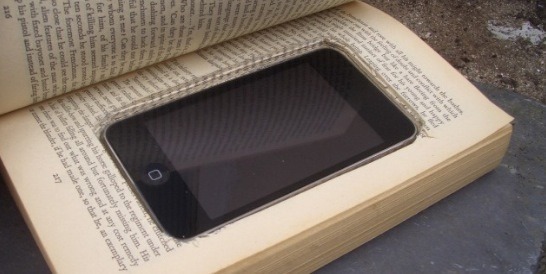 The phone is killing the book. And in some ways the phone is within us. It’s there even when it’s not. But the classroom is one of the few places we can fight back. And this is part of what we are trying to accomplish with the reading curriculum we are currently developing. Part of the answer to how the book can win out over the phone–or at least preserve some space–lies in looking backwards to what created reading and story-telling in the first place. At first reading was a social act, at least story telling was. Most people were illiterate; forms of entertainment were rare- a luxury good. Stories were passed down orally and shared in groups around the fire, told and re-told. The cost of a book itself was exorbitant compared to today. To own 40 books in your library would mean you were a rare collector and must also be rich indeed. The moveable type printing press—and series of changes in the accessibility of print—changed all that- slowly over time the price of book came down. Literacy increased. Reading your own book rather than sharing a story with others became more common. But even when you read alone you read the books that others read. So stories were still social phenomena. Something we enjoyed and experienced together. That drew us to them. Throughout the 18th and 19th century reading was the finest available technology for narrative and information. It was most often the entertainment, the release, the distraction. Reading novels was considered frivolous and a bit edgy- like Game of Thrones maybe. With no TV no radio no, never mind no internet. You would read for hours at a time perhaps, escaping into it, losing yourself. But reading still retained a social function. In a 19th century parlor people sat and read in the same room reading. They read passages–or books–to each other. The book was a social phenomena still. The solution to the future maybe lies in the roots of the past. In the isolated world of the internet where teens socialize now all in a room with their faces staring down into their own screen (even on dates we seem them at restaurants sitting at a table in their different worlds)–the social world the book can bring us is its differentiating factor. Reading together reconnects people. That’s why we think shared books and shared reading are so important. They cause us to read together or to share and discuss read experiences. When we read aloud together we hear the joy of the text and when great readers breath life and humor and pathos into it it makes the case for reading. Only reading aloud can sell students on that. And there is nothing more powerful than having those great readers be your peers. But even when the book is not read aloud the reading together from the same book and discussing how we all see it differently…that is a reconstruction of community. So… part of our recipe is: shared books; lots of reading aloud together; lots of reading aloud together in a way that celebrates books and brings them to life. And we seek to do this with the very best books books that instantly feel worth reading, an experience like nothing else. And we practice reading–solo or together–for sustained periods of time. Building a habit to counter act the distracted-ness of our inner phone. It’s an uphill climb we know, but we think this is part of how we help the book win out over the phone.